Coast to Coast Lowest Price Guarantee! FREE SHIPPING ANYWHERE in Canada! Large Volume - 100,000+ Items: Learn how our innovative methods & processes can save your organization time & money. Q: How do you provide files? Q: Do you keep the order of the photos? Q: May I place slides or negatives in the EZ-Box? 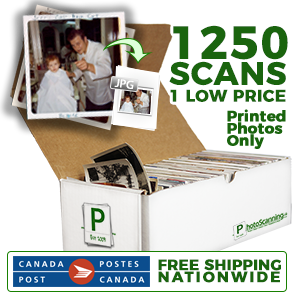 No, the EZ-Box is solely for printed photos - slides and negatives are billed separately at their per scan rates. Q: May I ship my own package in or am I required to use the EZ-Box? For orders containing multiple formats, or if it is more convenient to use your own packaging you may ship to us in an appropriate box. We accept all major couriers - return shipping is billed to the client via their preferred method. See more of our Frequently Asked Questions, many with video answers from our staff!